Eva supplies me with food for my dog and cats. The service is excellent and product is high quality with high content of chicken and my pets Love it! I first saw Husse stand at Dog show and I`m very pleased I got to talk to them. Now I don`t need to shop around, Eva delivers everything for free. Awesome! My dog had a very loose belly and never made solid poo's. Spoke to the man from Husse, came to my house spoke at feeding and types of food, and left a sample for my dog, very impressed at no time did he try and sell me anything. My dog loved the sample so when Peter phoned back I ordered a bag, he delivered himself at 7.30pm on a Friday night, the time I asked. I've never contacted a company before but felt I needed to email yourselves. 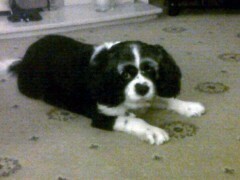 Our King Charles Spaniel has been very poorly with a cancer tumour which has been successfully removed. My vet explained his diet had to be changed to dry food to help his weight and recovery. I tried many brands but Murphy would not entertain any of them and therefore was loosing his battle. I then bought your 'Senior Dry Food' and Murphy started to eat it. At first we thought it was just a fluke but the next day it was eaten all up again and this has continued for 6 days now. I just wanted to say thank you, it may not seem much to most people but for us to see our special dog eat and starting to get his strength back is amazing! !.